What do American muscle cars and aging have in common? One of the most iconic eras in American automotive technology was the development of the muscle car in the 1960s. From Ford’s Mustang to Chevy’s Corvette, all of the major companies built cars that not only looked great, but could also really perform. Over the next few years the most popular muscle cars will be turning 50 and the ones that have had regular oil changes and the scheduled factory maintenance are still functioning out on the streets. Just like regular maintenance extends the useful life of a car, exercise improves the function of many of the physiological systems responsible for optimal health. The care required to ensure that a 50-year-old car can drive just as well now as when it first rolled off the factory floor is a fitting analogy for how exercise can be used to maintain optimal health and reduce the effects of the aging process. A car is designed to be driven. The engine and systems that control the automobile are most effective when operated on a regular basis. If a car sits idle for too long, the vital fluids such as engine oil or brake fluid can settle, break down and not be able to do their jobs effectively the next time the car is driven. The paint on a car left outside without proper protection will likely oxidize, the tires will deteriorate and parts will start to rust. On the other hand, if a car is driven and stored properly and, most importantly, maintained, then it can provide many years of safe operation and enjoyment for its owners. The physiological systems of the human body are similar to a car’s in that with the proper fuel (nutrition), maintenance and operation, it’s possible to have a long, healthy, vibrant life full of enjoyable physical activity. Just like a car left abandoned will fall apart over time, an individual who is sedentary, makes poor nutritional choices and participates in risky lifestyle habits such as smoking cigarettes or drinking too much alcohol could experience the effects of rapid aging and possibly a premature death. Though this may sound severe, overwhelming evidence indicates that adults with a sedentary lifestyle can expect to experience quicker degradation of physiological functions and actually have a greater risk of premature death than adults who exercise on a regular basis (Hurley, Hanson and Sheaff, 2011; American Council on Exercise, 2009; Taylor and Johnson, 2008). In addition, the World Health Organization lists physical inactivity as the fourth leading preventable risk factor for global mortality rates. The good news is that for most sedentary, deconditioned adults it is possible to adopt healthier lifestyle habits that can restore the body to good health even into the later years of life, just like a car can be rescued from the trash heap and restored to good working order. Healthy behaviors such as regular physical activity, proper nutrition, hydration and effective sleep patterns are all recognized as effective means for reducing the risk of developing many chronic diseases that can occur during the aging process (American Council on Exercise, 2009; Taylor and Johnson, 2008). From plastic surgery and Botox injections to anti-aging clinics that specialize in prescribing injections of anabolic steroids, Americans spend hundreds of millions of dollars a year pursuing the elusive fountain of youth. 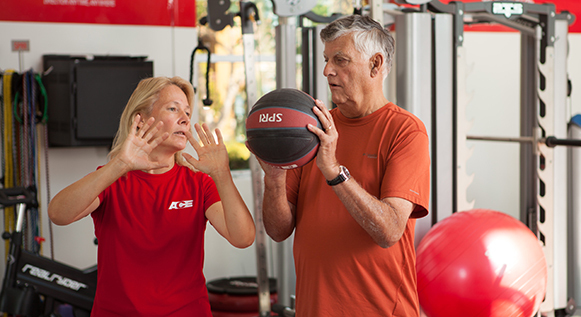 Unlike expensive, invasive medical procedures or costly and painful injections, the right type of exercise program can produce numerous benefits that minimize the effects of aging. There is a tremendous amount of evidence to suggest that high-intensity strength training and cardiorespiratory exercise programs can be the stimulus to produce numerous anti-aging benefits. It is not safe to simply introduce high-intensity exercise to any client, especially not an older adult. However, following a gradual progression of intensity such as that outlined by the ACE Integrated Fitness Training® (ACE IFT®) Model can give personal trainers the ability to design exercise programs with the necessary stimulus to provide anti-aging effects for their clients. Without the proper care and maintenance of healthy lifestyle habits like regular physical activity, the chronological aging process can have a devastating effect on the human body. Until someone invents a time machine, there is very little that can be done to counter the effects of chronological aging. However, the right kind of exercise can slow the effects of biological aging by stimulating the production of hormones that can build new muscle cells and improve the function of existing ones. The effects of the aging process can greatly diminish the mechanical, metabolic, hormonal and neural functions vital for energy production and control of the muscular activity responsible for human movement. Mechanical components of the human body include muscle, fascia, connective tissue, organs and skeletal structures. Metabolic functions control the breakdown of macronutrients for the production of chemical energy (adenosine triphosphate, or ATP) to fuel muscle contractions. Neural activity senses an external or internal stimulus and determines an appropriate response. Hormones are produced in reaction to various stimuli to control the functions and actions of specific cells. The changes listed in Table 1 happen to individuals who, throughout the aging process, maintain a sedentary lifestyle with minimal physical activity. Comparing Tables 1 and 2, which outlines the benefits of exercise, it’s easy to see that exercise can address a number of the physiological side effects of the aging process. For example, between the ages of 30 and 80, sedentary adults can experience as much as a 30 percent to 40 percent loss of muscular strength as a result of reduced levels of muscle mass, particularly the type II fibers responsible for strength and power production. The good news is that regular exercise is widely recognized as one of the most powerful means for stimulating structural, metabolic and functional re-organization of skeletal muscle and can be the most effective way to reduce this loss of muscle mass. 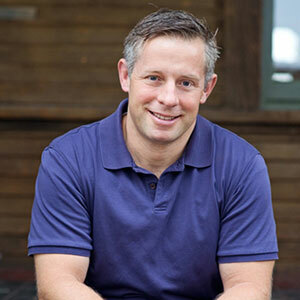 (Hakkinen, 2011; Schoenfeld, 2010; American Council on Exercise, 2009; Taylor and Johnson, 2008). Exercise is physical stress applied to the body. Two types of exercise stress play an instrumental role in reducing the effects of aging: mechanical stress in the form of resistance training and metabolic stress in the form of cardiorespiratory exercise. High-intensity exercise can provide the mechanical or metabolic stress necessary to stimulate production of the naturally occurring anabolic steroids, which promote muscle protein synthesis and increase lean muscle mass, both of which help mitigate the effects of the aging process. There are two primary types of hormones in the body: peptide and steroid. Peptide hormones interact with receptors on a cell membrane. Steroid hormones interact with receptors in the nucleus of a cell. The term anabolic refers to a physiological reaction that promotes cellular growth. (Reactions that break down cells into smaller components are called catabolic.) Therefore, anabolic steroids are simply hormones produced by the body to support and promote muscle protein synthesis, as well as stimulate the production of the satellite cells responsible for building new muscle tissue (Serra et al., 2011; Schoenfeld, 2010). Anabolic steroids are commonly referred to as performance-enhancing drugs used by athletes. While it is true that many athletes use supplemental anabolic steroids to improve strength and muscle mass, it is important to note that anabolic steroids are merely hormones naturally produced by the human body. High-intensity exercise is an essential stimulus responsible for the production of anabolic hormones, as well as their associated binding and receptor proteins (Serra et al., 2011; Schoenfeld, 2010; Godfrey and Blazevich, 2004). 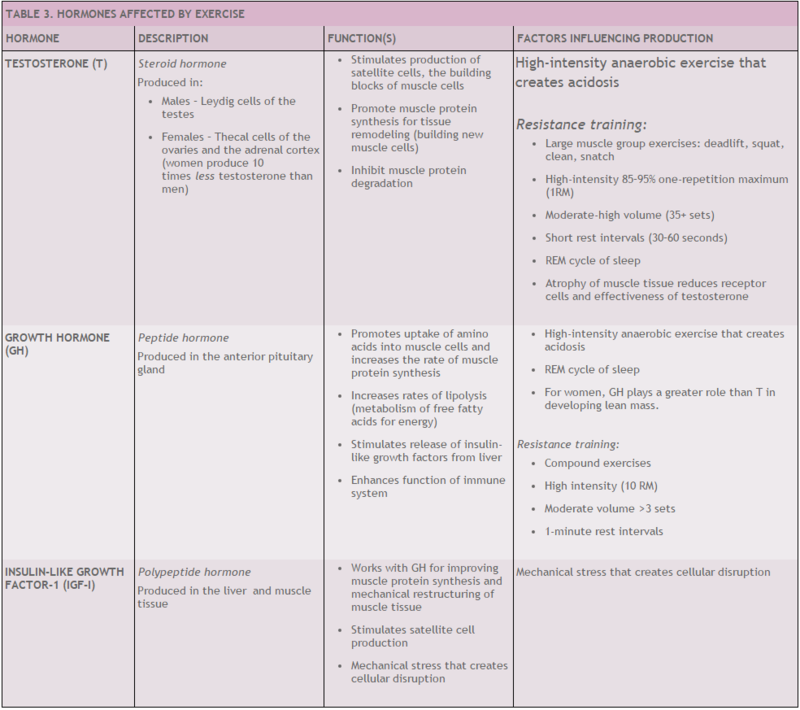 Exercise programs that stimulate the production of anabolic hormones, specifically testosterone, growth hormone and insulin-like growth factor-1, can improve the appearance and extend the functional lifespan of an older adult (Table 3). Regular exercise also increases levels of neurotransmitters, which facilitate cellular activity. This includes the catecholamines (epinephrine and norepinephrine) responsible for stimulating energy production, as well as brain-derived neurotrophic factor (BDNF), which can initiate the production of new brain cells. One important byproduct of exercise for older adults is an increase in BDNF and cognitive function. 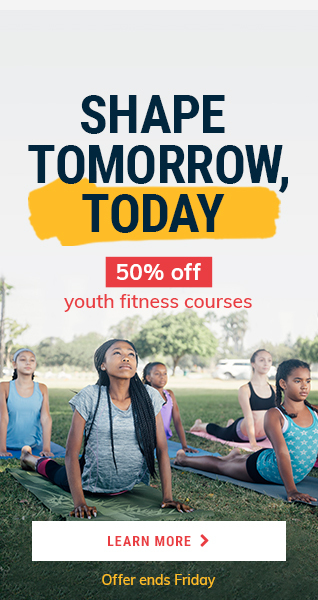 Exercise not only creates younger-looking muscles, but a brain capable of maintaining its optimal performance throughout the aging process (Chaddock, Voss and Kramer, 2012). 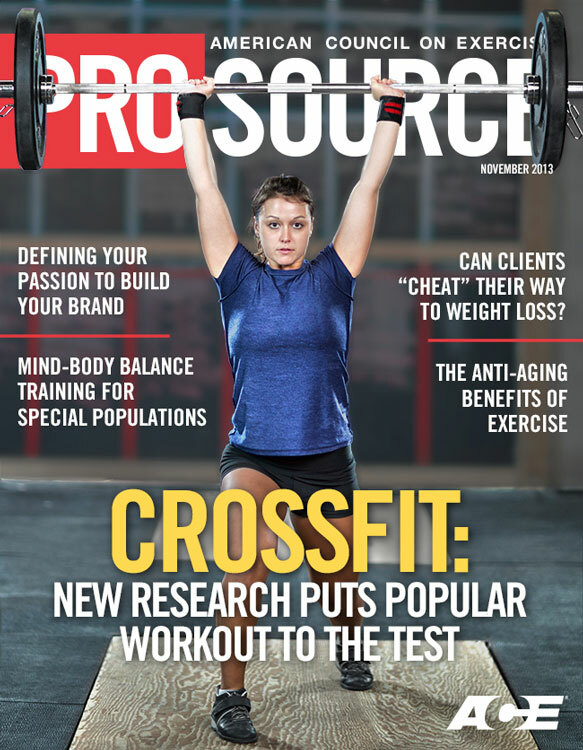 When discussing their research on the effects of resistance training on older adults and cognitive function, Chang and colleagues noted, “Our research found that resistance training could positively affect cognition, information processing, attention, memory formation and executive function” (Chang et al., 2012). The endocrine system will experience both acute and chronic adaptations to exercise. In the acute phase immediately after exercise the endocrine system will produce elevated levels of testosterone (T), growth hormone (GH) and insulin-like growth factor-1 (IGF-1) to promote repair to the tissue damaged by the exercise stress. Over the long term of an exercise program, the body will experience chronic adaptations of elevated levels of the receptor and binding proteins responsible for promoting cellular interactions with T, GH and IGF-1 (Serra et al., 2011; Schoenfeld, 2010; Goto et al., 2005). In a similar study comparing the results to the same resistance-training program performed by both college-aged (18–22 years) and middle-aged (35–50 years) men, Kerksick et al. (2009) found that the middle-aged men increased their strength and lean muscle mass, while reducing their fat mass, at the same rate as the younger men. In addition, the researchers observed that the middle-aged men actually experienced better body-composition results than the younger men. Exercise just doesn’t benefit older males, however. Research indicates that women can experience numerous benefits of exercise in their later years as well. In a study comparing the physiological response of women in their 20s to women in their 60s to the same cardiorespiratory exercise program, Ciolac, Brech and Greve (2010) found that older women were able to increase their exercise intensity at the same rate as the women who were almost 40 years younger. Older women can also experience benefits from resistance training and “seem to be able to gain strength to about the same extent as middle-aged or young adults when utilizing a similar type of low-volume total-body strength-training protocol” (Hakkinen, 2011). The good news is that the evidence indicates that high-intensity exercise, which creates mechanical or metabolic stress, can stimulate an anabolic response even in the later years of the human lifecycle. However, it is not enough for older adults to simply participate in low- or moderate-intensity exercise—the research indicates that moderate-to-vigorous intensity of training is most effective for stimulating the hormone responsible for muscle growth. Older adults who participate in high-intensity resistance training and cardiorespiratory exercise can increase their strength and lean muscle mass, helping them to maintain youthful levels of energy. Speaking about his extensive research studying the effects of exercise on older master athletes, Hakkinen noted, “Lifelong strength training seems to minimize age-related strength decreases at all ages, with master athletes at the age of 75 years demonstrating higher absolute strength values than untrained men at the age of 40” (Hakkinen, 2011). In his research on how GH responds to exercise in older adults, Godfrey wrote, “Resistance-trained older individuals seem to have a greater hormone response to a bout of intense exercise than endurance-trained individuals of the same age” (Godfrey and Blazevich, 2004). Rebuilding and restoring an old car to a like-new condition requires replacing many worn-out parts and repainting the exterior. Simply replacing old parts isn’t an option for many older adults and is certainly out of the scope of practice for personal trainers. However, gradually progressing the intensity of an older client’s exercise program to a point where he or she is using heavy weights for resistance training and high-intensity anaerobic intervals for cardio exercise can add new muscle and improve his or her appearance in much the same way that a good paint job can help an older car look like new. In their research on how older males respond to resistance training Izquierdo and colleagues noted, “Skeletal muscle of older people seems to retain capacity to undergo training-induced hypertrophy when the volume, intensity and duration of the training period are sufficient” (Izquierdo et al., 2001). Just because a client is older does not mean that he or she is exempt from performing higher-intensity exercises. With the appropriate progression of intensity, older adults can and should participate in higher-intensity exercise as long as there are no medical concerns. “Strength training can lead to considerable improvements in strength of all muscle groups examined independent of age and gender, when both the loading intensity of training and duration of the resistance training period are sufficient” (Hakkinen, 2011). The following exercise program is for 40-something female who is comfortable with resistance training and wants to “lose weight and tone up.” The emphasis of this program is to produce the necessary overload of mechanical stress to stimulate an anabolic response and promote elevated levels of GH. For optimal results, the workout should be performed two to three times per week; the other exercise sessions can focus on bodyweight training like yoga or cardiorespiratory training. It is important to note that not all women will be comfortable with resistance training, but if they want the anti-aging benefits of exercise then it is important to use the appropriate stimulus. * Note: Due to the high-intensity nature of these exercise programs, give clients permission to take a week or two off every few months to help the body rest, repair and fully recover. Note: 10 RM = A weight that can be lifted for a maximum of 10 repetitions; if >10 is possible, add weight. Next is a sample exercise program for 50-something male, who wants to increase lean muscle mass. The program emphasizes exercises to create a metabolic overload to stimulate an anabolic response from the endocrine system and promote T production. The workout should be performed as a circuit with the appropriate rest interval (30–60 seconds) after each exercise before progressing to the next. For optimal results, the client should plan on doing the workouts when he can get a good night’s sleep to promote proper recovery and do no more than three high-intensity workouts per week. American Council on Exercise (2009). ACE Advanced Health and Fitness Specialist Manual. San Diego: American Council on Exercise. Baker, J. et al. (2006). Effects of age on testosterone responses to resistance exercise and musculoskeletal variables in men. Journal of Strength and Conditioning Research, 20, 4, 874-881. Candow, D. et al. (2011). Short-term heavy resistance training eliminates age-related deficits in muscle mass and strength in older males. Journal of Strength and Conditioning Research, 25, 2, 326-333. Chaddock, L., Voss, M. and Kramer, A. (2012). Physical activity and fitness effects on cognition and brain health in children and older adults. Kinesiology Review, 12, 1, 37-45. Chang, Y. et al. (2012). Effect of resistance-exercise training on cognitive function in healthy older adults: A Review. Journal of Aging and Physical Activity, 20, 497-517. Ciolac, E.G., Brech, G.C. and Greve, J.M.D. (2010). Age does not affect exercise intensity progression among women. Journal of Strength and Conditioning Research, 24, 11, 3023-3030. Goto, K. et al. (2005). 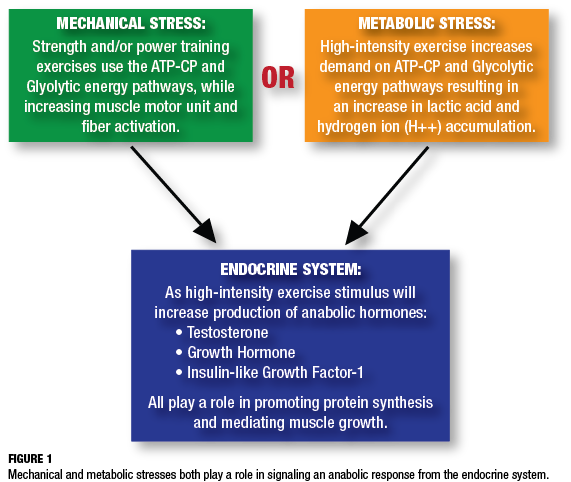 The impact of metabolic stress on hormonal responses and muscular adaptations. Medicine and Science in Sports and Exercise, 955-963. Hakkinen, K. (2011). Lecture: “The aging neuromuscular system in men and women still responds to strength training.” Given at the NSCA National Conference July 8-11, 2011. Hurley, B.F., Hanson, E.D. and Shaeff, A.K. (2011). Strength training as a countermeasure to aging muscle and chronic disease. Sports Medicine, 41, 4, 289-306. Kerksick, C. et al. (2009). Early-phase adaptations to a split-body, linear periodization resistance training program in college-aged and middle-aged men. Journal of Strength and Conditioning Research, 23, 3, 962-970. Linnam, V. et al. (2005). Acute hormonal responses to submaximal and maximal heavy resistance and explosive exercises in men and women. Journal of Strength and Conditioning Research, 19, 3, 566-571. Philippou, A. et al. (2007). The role of insulin-like growth factor 1 (IGF-1) in skeletal muscle physiology. In Vivo, 21, 45-54. Serra, C. et al. (2011). The role of GH and IGF-1 in mediating anabolic effects of testosterone on androgen-responsive muscle. Endocrinology, 152, 1, 193-206. Schoenfeld, B. (2010). The mechanisms of muscle hypertrophy and their application to resistance training. Journal of Strength and Conditioning Research, 24, 10, 2857-2872. Taylor, A. and Johnson, M. (2008). 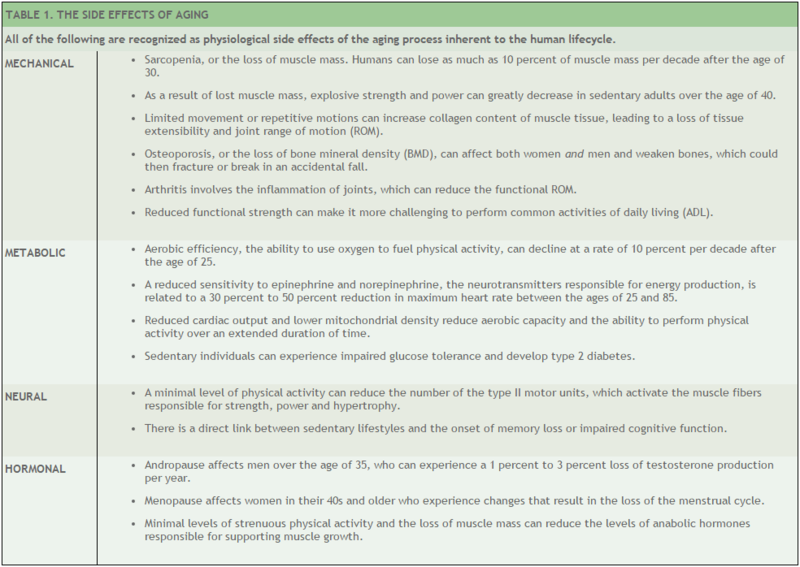 Physiology of Exercise and Healthy Aging. Champaign, Ill.: Human Kinetics. The World Health Organization lists ______________as the fourth leading preventable risk factor for global mortality rates. _____________ refers to progressive changes in all physiological structures and functions affecting the entire body, from individual cells and connective tissues to vital organs. Humans can lose as much as ____ percent of muscle mass per decade after the age of 30.